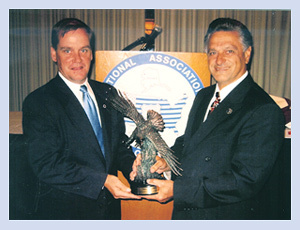 Photo Caption:Thomas Nee(L) President of NAPO, presents Thomas Scotto(R) with the most prestigious award in Law Enforcement. The only other recipient of this award was US President Bill Clinton for his unselfish efforts to pass the Crime Bill of 1995. During this time I had the good fortune to work with many labor union leaders and was always available to help anyone in need. Incorporated DEA's Widows' and Children's Fund and trademarked union logos, including the gold detective shield. During a 38 year career as a police officer and detective, received over 30 NYPD awards for exceptional and meritorious performance and inducted into the NYPD Honor Legion.